Travel to a beautiful campsite located just a short distance away from Bangalore and try your hand at a variety of different adventures. You can go zip-lining at the campsite or kayaking at the nearby Hosa Kere lake. A short trek from the campsite will take you into the hills to explore the scenic beauty that flourishes not too far away from Bangalore. Alternatively, you can also have fun with your friends or family over a game of volleyball, badminton or cricket. This short day adventure trip in Bangalore is excellent for quick getaways filled with fun adventures in the lap of nature. Located just 60 kms from Bangalore, this wonderful campsite lies in the folds of the SRS Hills on the shores of the shallow water Hosa Kere Lake. 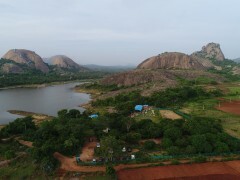 With it rich natural beauty of grasslands and hills along with the easy accessibility to Bangalore, it has become a popular destination for day adventure trips and overnight camping trips. You can go on treks around the campsite that will take you into the hills to explore local caves or take a dip into the nearby lake. At the campsite, activities like kayaking and zip-lining are equally fun and thrilling. • Have fun with your friends or family at a beautiful campsite. Travellers are required to follow instructions of the adventure guide while undertaking any adventure activity during this day adventure trip in Bangalore. Consumption of alcohol, drugs and tobacco products like cigarettes is strictly prohibited during trip. For cancellations made more than 10 days before the scheduled Bangalore day adventure trip: 100% refund. For cancellations made between 7-10 days before the scheduled Bangalore day adventure trip: 75% refund. For cancellations made between 3-6 days before the scheduled Bangalore day adventure trip: 50% refund. For cancellations made less than 3 days before the scheduled Bangalore day adventure trip: no refund. Arrive at the campsite by early morning. You can spend the rest of the day at leisure indulging in adventure activities. Embark on a short trek around the campsite to explore local caves or try kayaking or swimming in the Hosa Kere lake. Within the campsite, you can also enjoy some outdoor games like cricket, volleyball, badminton or archery. There are several indoor games as well such as carom or cards. Take a walk along the campsite to explore the area, or participate in one of many adventure activities on offer like kayaking, rappelling or zip-lining. After a day spend enjoying the outdoors, you'll check-out by late evening. Your trip ends here. Personal expenses such as additional meals or beverages, apparel or gear etc. 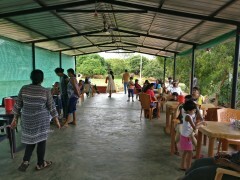 Today's meal package includes breakfast, lunch and evening snacks. No accommodation is provided.